We’ll start this with a bold statement: 2014 was one of the greatest years in the history of graphic novels. The books we left off of our list, which include gems like “Through the Woods”, “Beautiful Darkness”, “Sam Zabel and the Magic Pen”, “Hip Hop Family Tree Volume Two”, “This One Summer”, and many more, would have formed an incredible top five in their own right. But at least for one last year, the Best Graphic Novel is condensed to five books, and we have a hell of a collection leading the way. Take a look at Multiversity’s top five graphic novels of the year, and please, share your favorites in the comments. We love hearing your thoughts on the subject. 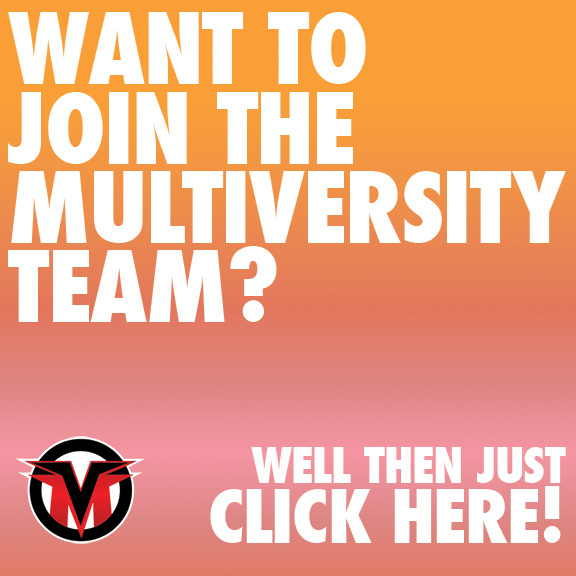 Note: All of Multiversity’s 2014 in Review awards are based off of all of the contributing writing team voting to decide each rank. Every list is combined with equal points for every voter, and the results are what you find below. Looking for the rest of our 2014 in Review entries? Find them all here. Why it made the list (Greg Matiasevich): It is no secret I’m a huge fan of Jaime Hernandez’s work in general, and his Locas serial in “Love & Rockets” in particular. Running over 30 years at this point, you can track Jaime’s maturation as an artist and storyteller in those pages. And while “The Love Bunglers” isn’t THE culmination of his work as a cartoonist or with these characters, it certainly is A culmination, because he brings every tool and technique to bear in executing it. If you have time, I strongly encourage you to listen to the Robots From Tomorrow talk Mike Romeo and I did on the book back in June because I don’t have the space here to really do this book justice. But I can say that it is a phenomenally engaging and inviting work even if you have never read anything with these characters before. It is heartbreaking, hilarious, whimsical, weighted, disarming, and devastating. “The Love Bunglers” may have been 30 years in the making, but every one of those years was well-spent if this is the masterpiece we have as the result. Burns has always been one of comics’ best talents, but he has truly outdone himself here with the execution and structure of his latest series. Throughout all three books, in fact, Burns has really pushed himself into trying something new, something more structured and layered and intertwined. Burns is certainly known for his horror, as well as his tragic and skewered looks at slice of life-style comics, but there’s something so entirely different about “Sugar Skull” and its predecessors. It’s a very dark read, quite heavy powerful with its imagery, but Burns’ work cuts deep like a knife at all of the fears that keep those of us with some form of anxiety up at night. Suffice it to say, if for some reason you did not cross path with Burns’ latest, then you’ve missed out. Perhaps the magnum opus of his career, “Sugar Skull” is a prime example of why comics have earned and deserved literary respect, with a complex work whose content can keep you up at night. Why it made the list (Brian Salvatore): There are very few things in my life that can remind me of being a 6 year old like comics and professional wrestling. Reading this book was like getting a nostalgia shot directly to my heart, and left me wanting more. Box Brown is a masterful storyteller, and he manages to weave together facts, mythical tales, and a healthy dose of kayfabe (the insider term for wrestling’s falsity) to form a story that manages to both humanize Andre and make him even larger than life. Brown’s art is clean and precise, allowing the absurdity inherent to the story to remain in the forefront, without ever devolving into parody, or even playful mockery. This is a seriously funny, amazing and heartbreaking story, and should be enjoyable to just about anyone, wrestling fan or not. Why it made the list (David Harper): Farel Dalrymple’s “The Wrenchies” is a hard book to describe, but I think I’ve got a pretty good explanation as to what is so incredible about it. It, in its 300+ pages, might be the graphic novel that most perfectly explains and expresses the power of the comic art form. That’s a pretty substantial statement to make, but hear me out. This book, which takes place in an array of times, locations, dimensions and mindsets, is something that wouldn’t really work in any other medium. Its reliance on subtle yet potent visual storytelling precludes it from being a book. Its expansive reach, often horrific look and use of interior dialogue makes it something that might be entirely unfilmable. It could be animated, maybe, but its something that needs a soft touch in a way animation struggles with. In short, it is something that could only be a comic book, showing off the grandeur and capability of the art form, and it is a stunning example of it at the same time. Dalrymple’s cartooning gives everything an otherworldly feel, but at the same time does an exceptional job of grounding us in this grotesque otherverse. It is, in a weird way, the type of story that could be a child’s fantasy, down to one of the Wrenchies (the gang in the book, not the book itself) wearing a visor not unlike the one Cyclops wears. It’s like a corruption of those stories kids connect with like “The Never Ending Story”, but strangely inviting and engaging at the same time. This book will make you question what’s real and what’s not constantly, yet it never stops making you invested in the story’s present. It’s a whole lot of things, but at its core, it’s just a remarkable comic. It’s a stunning achievement, and something that I think will carry on as an important work going forward. Why it made the list (Jess Camacho): Bryan Lee O’Malley’s “Seconds” proved that he was more than just “Scott Pilgrim”. “Seconds” is a hip, modern combination of The Butterfly Effect and It’s a Wonderful Life. “Seconds” features one of the best protagonists of the year with Katie Clay. She is us. She is all our doubts, fears and self loathing with all the natural humor that comes from our everyday lives. Katie is also one of the very few realistically modern characters of the year. She feels like someone actually living in 2014 and not some caricature of today’s younger generation. O’Malley’s writing is equally as good here as it was in “Scott Pilgrim” as he finds the perfect balance between humor and raw emotion. As fantastical as the premise is there’s a great lesson to be taken away about not living in the past and appreciating what you have in front of you. “Scott Pilgrim” taught a lesson (albeit a different one) but because this is one single story, that message hits the reader harder and more effectively because there are less pages to tell the story. “Seconds” is visually the strongest of all his work. Pages go by with no dialogue but each panel is full of more than just plot progression. O’Malley doesn’t need to write words because Katie’s expressions tells more than words can describe an din this sense he adds more to the character development. Nathan Fairbairn handles the coloring in “Seconds” and while he doesn’t use a complicated palette, it’s still very effective because it adds another layer to O’Malley’s pencils. The backgrounds aren’t overly detailed due to the minimal, manga like work by O’Malley but Fairbairn is able to tie each panel together. He adds more atmosphere to each panel by tying it all together through his coloring. He draws your eyes to the most important pieces of the story. For example, when Katie is in the dark about to eat another mushroom, your eyes go straight to the mushroom and her eyes. This is a powerful book that you’ll wish you could experience for the first time again the moment you reach the last page.